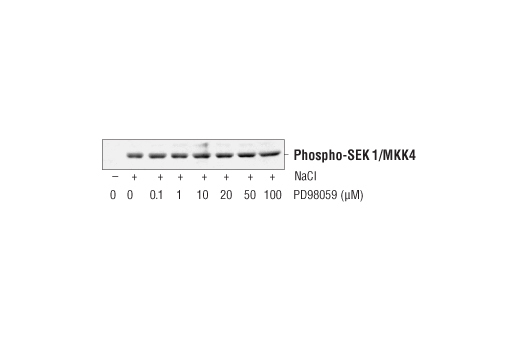 Western blot analysis of extracts from 293 cells, untreated (-) or NaCl-treated (0.7 M, 30 min; +) and PD98059 pretreatment (indicated concentrations, 1 hr), using Phospho-SEK1/MKK4 (Thr261) Antibody #9151. Western blot analysis of extracts from COS cells transfected with pCMV-MKK3, untreated (-) or treated with Anisomycin #2222 (20 μg/ml, 30 min; +) and PD98059 pretreatment (indicated concentrations, 1 hr), using Phospho-MKK3 (Ser189)/MKK6 (Ser207) Antibody #9231. Western blot analysis of extracts from SK-N-MC cells, untreated (-) or treated with Human Basic Fibroblast Growth Factor (hFGF basic/FGF2) #8910 (100 ng/ml, 30 min; +) and PD98059 pretreatment (indicated concentrations, 1 hr), using Phospho-p44/42 MAPK (Erk1/2) (Thr202/Tyr204) Antibody #9101. PD98059 is supplied as a lyophilized powder. For a 20 mM stock, reconstitute 1.5 mg in 280 μl anhydrous DMSO (5 mg in 933.3 μl anhydrous DMSO). For 50 mM stock, reconstitute 1.5 mg in 112 μl anhydrous DMSO (5 mg in 373.3 μl). Working concentrations and length of treatment can vary depending on the desired effect, but it is typically used as a pretreatment at 5 - 50 μM for one hour prior to treating with a stimulator. Store lyophilized or in solution at -20ºC, desiccated. In lyophilized form, the chemical is stable for 24 months. Once in solution, use within 3 months to prevent loss of potency. Aliquot to avoid multiple freeze/thaw cycles. Solubility: Soluble in anhydrous DMSO at 25 mg/ml. Very poorly soluble in water. The MAPK (Erk) kinases MEK1 and MEK2 are dual-specificity protein kinases that play a role in a mitogen activated protein kinase cascade that controls cell growth and differentiation (1-3). Activation of MEK1 and MEK2 occurs through phosphorylation of Ser217 and Ser221 within the activation loop of subdomain VIII by Raf-like molecules. MEK1/2 is activated by a wide variety of growth factors and cytokines, and through membrane depolarization and calcium influx (1-4). Constitutively active MEK1/2 can promote transformation of NIH/3T3 cells and differentiation of PC-12 cells (4). 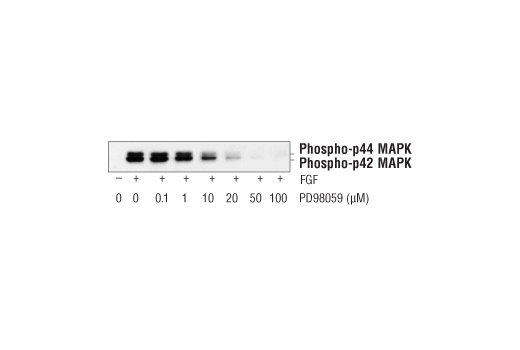 MEK activates p44 and p42 MAP kinase by phosphorylating both threonine and tyrosine residues at sites located within the activation loop of kinase subdomain VIII. PD98059 is a highly selective in vitro inhibitor of MEK1 activation and the MAP kinase cascade (1-4). 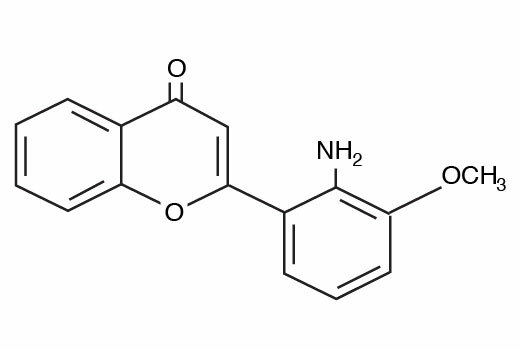 The PD98059 flavonoid binds to inactive forms of MEK1 and prevents activation by upstream activators, such as c-Raf (3). PD98059 inhibits MEK1 and MEK2 activation with IC50 values of 4 µM and 50 µM, respectively (1-3). Research studies demonstrate that PD98059 does not inhibit activation of other highly related dual-specificity protein kinases or the activity of more than 18 Ser/Thr protein kinases (3). 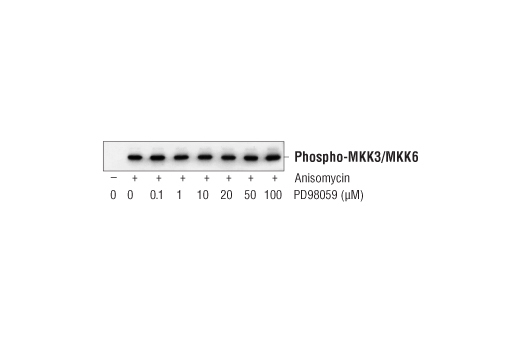 Western blot analyses indicate that PD98059 does not inhibit activation of MKK3 or SEK (MKK4) at concentrations up to 100 µM, and does not inhibit MKK6 or related family members.